Pastor Matt Farinella accepted Christ as his personal Savior in the winter of 1985. On October 9th of 1994, he felt the call of God upon his life to preach the gospel and surrendered his life to serve the Lord. From there he pursued his calling to Oklahoma City in 1999 where he attended Heartland Baptist Bible College. He graduated with honors in 2003 receiving his Bachelors in Theology, majoring in missions. It was there that he met his future wife, Alyssa. After they graduated, they married and moved to Stillwater, Oklahoma to train under the ministry of Pastor Wayne Hardy at Bible Baptist Church. Here they completed a two-year internship of practical, hands-on ministry training. 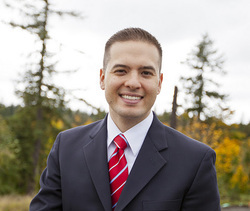 Finally, in June of 2006, Pastor Farinella moved his family to Washington to start a new church through the ministry of Woodin Valley Baptist Church of Woodinville, WA. After settling in Sammamish, Pastor Farinella began holding services under the authority of his sending Church, on November 5th of 2006. Four years later on November 7th, 2010, Foundation Baptist Church held its charter service, launching out on a course to discover its God-given potential for this great community. Joel received Jesus Christ as his personal savior in November of 2006 at the age of 31 while attending a Karate ministry out of Bible Baptist Church in Puyallup Washington. Shortly after his salvation, his wife Christelle was saved through the same ministry. After they were baptized, they joined Woodin Valley Baptist Church, which was closer to their home in Duvall, Washington. It was there that they established the fundamentals for their faith and service. At the same time Woodin Valley was planting Foundation Baptist Church with Pastor Matt Farinella. The Creekmores were led to help the church plant and eventually transitioned to Foundation Baptist Church in order to continue to be a part of what God was doing there. During the 2011 Spiritual Leadership Conference, the Creekmores surrendered to God’s call to full-time ministry. Since that time, Joel has completed classes in Heartland Baptist Bible College’s extension studies and online Master’s program. Extension studies allowed Joel the opportunity to stay serving at Foundation Baptist Church and develop his ministry skills there under the guidance of Pastor Matt. Joel and Christelle Creekmore were married in September of 1997 and have six children. They are blessed with the fact that each of their children have a testimony of salvation and serve the Lord with their parents.